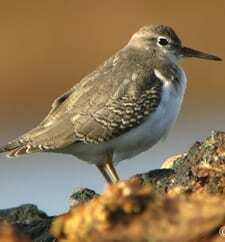 The dapper Spotted Sandpiper makes a great ambassador for the notoriously difficult-to-identify shorebirds. They occur all across North America, they are distinctive in both looks and actions, and they’re handsome. They also have intriguing social lives in which females take the lead and males raise the young. With their richly spotted breeding plumage, teetering gait, stuttering wingbeats, and showy courtship dances, this bird is among the most notable and memorable shorebirds in North America.